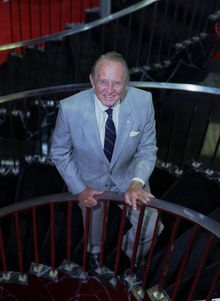 Art Linkletter poses for a photo Tuesday, June 27, 2006, at his office in Los Angeles. "He lived a long, full, pure life, and the Lord had need for him," Hershey said. Linkletter had been ill "in the last few weeks time, but bear in mind he was 97 years old. He wasn't eating well, and the aging process took him," Hershey said. Linkletter hadn't been diagnosed with any life-threatening disease, he said. Linkletter was known on TV for his funny interviews with children and ordinary folks. He also collected their comments in a number of best-selling books. "Art Linkletter's House Party," one of television's longest-running variety shows, debuted on radio in 1944 and was seen on CBS-TV from 1952 to 1969. Though it had many features, the best known was the daily interviews with schoolchildren. "On `House Party' I would talk to you and bring out the fact that you had been letting your boss beat you at golf over a period of months as part of your campaign to get a raise," Linkletter wrote. "All the while, without your knowledge, your boss would be sitting a few feet away listening, and at the appropriate moment, I would bring you together," he said. "Now, that's funny, because the laugh arises out of a real situation." Linkletter collected quotes from children into "Kids Say The Darndest Things," and it sold in the millions. The book "70 Years of Best Sellers 1895-1965" ranked "Kids Say the Darndest Things" as the 15th top seller among nonfiction books in that period. The prime time "People Are Funny," which began on radio in 1942 and ran on TV from 1954 to 1961, emphasized slapstick humor and audience participation--things like throwing a pie in the face of a contestant who couldn't tell his Social Security number in five seconds, or asking him to go out and cash a check written on the side of a watermelon. The down-to-earth charm of Linkletter's broadcast persona seemed to be mirrored by his private life with his wife of more than a half-century, Lois. They had five children, whom he wrote about in his books and called the "Links." But in 1969, his 20-year-old daughter Diane jumped to her death from her sixth-floor Hollywood apartment. He blamed her death on LSD use, but toxicology tests found no LSD in her body after she died. Still, the tragedy prompted Linkletter to become a crusader against drugs. A son, Robert, died in a car accident in 1980. Another son, Jack Linkletter, was 70 when he died of lymphoma in 2007. Art Linkletter got his first taste of broadcasting with a part-time job while attending San Diego State College in the early 1930s. He graduated in 1934. "I was studying to be an English professor," Linkletter once said. "But as they say, life is what happens to you while you're making other plans." He held a series of radio and promotion jobs in California and Texas, experimenting with audience participation and remote broadcasts, before forming his own production company in the 1940s and striking it big with "People Are Funny" and "House Party." Linkletter was born Arthur Gordon Kelly on July 17, 1912, in Moose Jaw, Saskatchewan. His unwed mother put him up for adoption when he was a baby; when he was about 7, he and his adoptive parents moved to the U.S., eventually settling in San Diego. He recalled his preacher-father forced him to take odd jobs to help the family. So Linkletter left and became a hobo, hopping trains across the West, working where he could. He recalled later that he felt the religious faith instilled by his father had been a great gift. After leaving daily broadcasting in 1969, Linkletter continued to write, lecture and appear in television commercials. Among his other books, were "Old Age is Not for Sissies," "How To Be a Supersalesman," "Confessions of a Happy Man," "Hobo on the Way to Heaven" and his autobiography, '`I Didn't Do It Alone." A recording Linkletter made with his daughter Diane not long before she died, "We Love You, Call Collect," was issued after her death and won a Grammy award for best spoken word recording. "Life is not fair ... not easy," Linkletter said in a 1990 interview by The Associated Press. "Outside, peer pressure can wreak havoc with the nicest families. So that's the part that's a gamble. "But I'm an optimist. Even though I've had tragedies in my life, and I've seen a lot of difficult things, I still am an optimist," he said. Linkletter had extensive business interests. He headed a company involved in real estate development and management and operation of cattle ranches in Montana, New Mexico and California. He held interests in oil and gas wells, owned livestock in Australia and was involved in a solar energy firm. He is survived by his wife, Lois, whom he married in 1935, and daughters Dawn Griffin and Sharon Linkletter, as well as seven grandchildren and 15 great-grandchildren. Godspeed Art, and thank you for sharing a part of your life with us. Thank you to everyone at the Biddestone Arms for maikng our wedding reception perfect.The food was magnificent, people are still raving about the roast beef! The pub looked gorgeous as always and the staff were as friendly and helpful as possible.We had an amazing day and cannot thank you enough.We will be back very soon! I found just what I was needed, and it was entetraining! loved this man's personality! long live his legend! Art Linkletter was one of my childhood heroes. I loved to watch him interview the children on Kids Say the Darndest Things. He had such a gift for bringing out the best in people and was the epitomy of a true Christian. You could tell that he loved and respected all people with whom he came in contact. He will be missed. I wish that there were more people like him in entertainment. I remember watching Art Linkletter's show on television as a kid and remember how funny I thought he was and how I wished I could be one of the kids he was interviewing! He always made me laugh as a child, as a young adult and now as a retiree. His wisdom, calm demeanor and insight truly made him a well respected gentle man. He is another gem from his generation who will be greatly missed and whose spirit should be emulated by some of today's entertainers. May God bless the family and give you peace. This man sure could make a lot of people laugh, but now he is probably in heaven smiling. I use to love him talk to the kids and their responses to his questions. Many Smiles Upon You the Family! I recall laughing at those wonderful kids Art used to interview so adroitly. This when I was just a kid myself. My life changed dramatically after reading his co-authored book - Make the Rest of Your Life The Best of Your Life, and am attempting to follow its dictates as closely as possible. One of the general suggestions was to pursue your passions. I have done just that - closed my official law office, (maintaining a virtual office) and am Santa 24/7, 365. Thank you Art for your years of enjoyment and great advice. 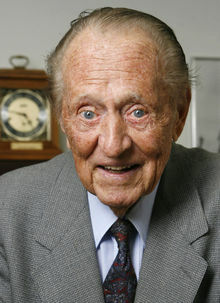 To The Family and Friends of Art Linkletter, We are sorry for the loss of a fine, gifted, and Godly man. Art is in his eternal home with his Savior & Lord! God Bless all of you with peace, comfort, and strength. I remember watching Art when I was younger. I have some wonderful memories of watching your show with my Mom. Thank you for the hours of laughter you gave us and may you be filling heaven with laughter now. God Bless You Mr. Linkletter, and may God be with your family now. Our Hero, Our Angel ! the world is a little sadder with the passing of this great man...may god open his arms and welcome art into heaven,,hope he meets up with my dad...thanks art for the memorys,, love you!!!!!!!! 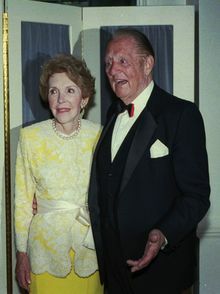 Former first lady Nancy Reagan stands besides veteran entertainer and humorist Art Linkletter as they enter the lounge at the Beverly Hilton Hotel in Beverly Hills, Calif., April 23, 1995. Sen. Bill Frist, R-Tenn., talks about health policy as longtime TV personality Art Linkletter, spokesman for the United States Seniors Association, listens at left, during the Republican National Committee Platform Policy Hearing at Sinclair College, Monday, June 19, 2000, in Dayton, Ohio. 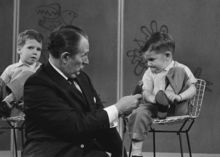 In this April 5, 1962 file photo, TV personality Art Linkletter talks with 4-year-old Ronnie Glahn shows Art Linkletter his idea of how bad guys look, on Art's TV show in Hollywood, April 5, 1962 in Los Angeles. From hobo to celebrity, it's been a remarkable journey for Art Linkletter, who says he never intended to get into show business in the first place. "I was studying to be an English professor," said Linkletter, seen in Los Angeles in June 1990. Art Linkletter, right, arrives during Disney's 50th Anniversary Global Celebration held at Disneyland in Anaheim, Calif., Thursday, May 5, 2005.